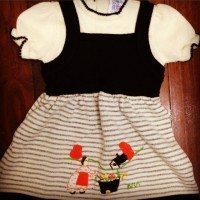 This sweet as pie little girls dress is a retro classic. Designed to look like a 2 piece item, it also features a cute appliqué on the skirt. It is dark brown & cream in colour. How cute would this look on your little princess with white wool stockings & black patent shoes?…too adorable & too bad my girls are now teenagers! This sweet dress would fit a 1.5 – 2 year old.